‘Extreme comedy’ Double the Fist is coming back to ABC. The second season will screen first on ABC2, from 9:30pm Thursday August 14 and a day later on ABC1 at 11:20pm. Guests this series will include Bruce Spence, Kate Fitzpatrick, Hollie Andrew, Ahn Do, John Leary, Ian Turpie, and The Umbilical Brothers. 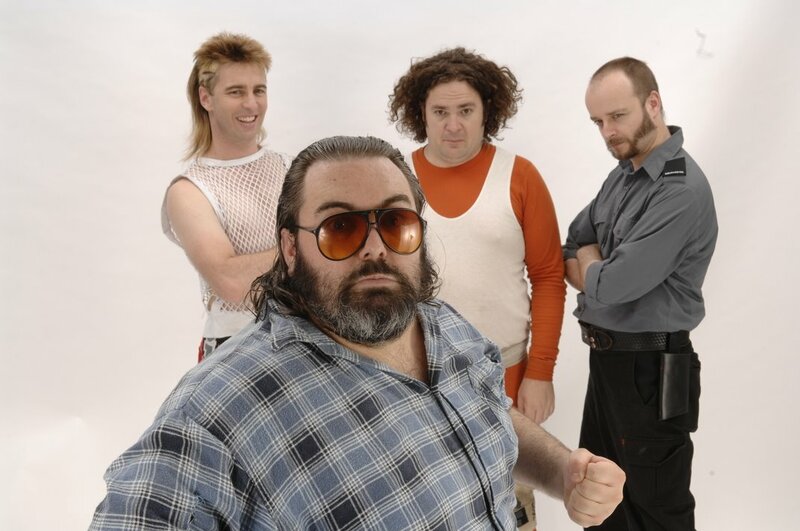 The comedy team surprised everybody in 2004 when it won an AFI Award for best comedy over Kath & Kim and Skithouse. After the first series, the ABC was undecided whether to continue the show. In March 2006, after an online petition from fans, a second series was approved. Douse the lights and board up the doors – ABC TV’s AFI award-winning comedy, Double The Fist, is back for a new season of over-the-top action. More anarchic than ‘The Young Ones’, more surreal than ‘The Mighty Boosh’ and chock-full of seething anger and blood-soaked special effects, Double The Fist is testosterone-fuelled TV that shows no mercy. Three years in the making, this new 8 x 30-minute action-packed comedy series is a cinematic epic of love, betrayal and time travel – spiked with high adventure, low blows and more digital effects than ‘Transformers’. Led by charismatic crusader Steve Foxx, the Fist Team includes extreme sportsman Rod; the mysterious Mephisto; that large, loveable lump of man meat The Womp; ‘Panda’ the panda; vending machine assassin Tara; Ballistic Man, mythical warrior and Odin, professional wrestler. With the power of Fist, their mission is to make weakness history, once and for all. Weakness is a plague devouring the very fabric of society. We’re surrounded by aziness, relaxation, pastimes, manners, compassion, hygiene, water sports, the internet… All symptoms of softness. But don’t panic – Steve Foxx has found the root of the epidemic, and he’s ready to strike a deathblow to the candyfloss comfort that has ensnared 90% of all Australians. The fight will not be easily won – the mighty Fist Team must battle council workers and shape-shifting lizards, naughty hypnotists and a Swedish furniture empire. There are naked vampires and rogue websites, 18th century sea captains, a renegade men’s group, medieval reenactors, underwater dinosaurs, sweatshop worker elves and even love. Will love bar Steve’s way? People call love the strongest force on earth. They haven’t met Steve Foxx. Australian acting luminaries lighting up the screen in this new series of Double The Fist include: Bruce Spence as a baby-eating mayor, Kate Fitzpatrick, Hollie Andrew, Ahn Do, John Leary, Ian Turpie, and The Umbilical Brothers. Double The Fist is big, brash no-apologies comedy with heart and brains and spine. It flips between satire and action, slapstick and thriller, character-based comedy and bombastic special-effects extravaganza. In a world running short on ideas, you have to give them this: there’s nothing else like it on TV. It’s not been long on the shelf – only fully delivered about six weeks ago. The series was then in financing for a time, and the very fistworthy AFC and NSWFTO got on board with investment. Following the shoot, the edit was laborious – this series has more CGI than Transformers and it took an age for the small and obsessively dedicated team to render the incredible effects. It’s certainly been too long between drinks, but will be worth the wait! ABC says “three years in the making” which is probably a better way of saying “three years undecided, shooting, and awaiting scheduling.” As I said, it did well at the AFIs so not sure what the wait was over. Wasn’t this second season filmed like a year ago? I even recall it being plugged on JTV last year! Thank god…finally something decent to watch!!! DTF is a seriously good show…very under-rated!! !